Conjure up the holidays! 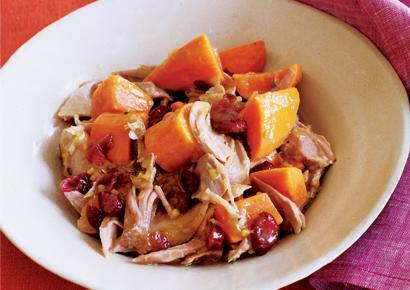 Cranberries and ginger give this turkey stew a sweet-and-sour tang; $2.21 per serving. 1. Combine turkey, onion, honey, vinegar, ginger, salt, pepper, and stock in large slow cooker. Cover and cook on low 5 hours. Add potatoes and cranberries. Cook until potatoes are tender, 45 minutes more. 2. Remove turkey and pull meat from bones. Pour one-quarter of the liquid into small pot and whisk in flour until smooth. Slowly whisk in remaining liquid. 3. Toss meat, potatoes, and cranberries with gravy and reheat if necessary. No need to sabotage a perfectly good vegetable by drowning it in a pool of cream of mushroom soup and deep-fried onions. This lean bean dish delivers just as much flavor and crunch, and it sidesteps two-thirds of the belly-bloating sodium you'll find in a casserole. 1/ Bring a large pot of water to a boil. 2/ While water is heating, pour olive oil into a large saute pan over medium heat. Add shallots. Reduce heat to medium-low and saute until shallots are soft, about 10 minutes. Add chicken broth, 3/4 teaspoon salt, and 1/4 teaspoon pepper; stir well. Remove from heat. 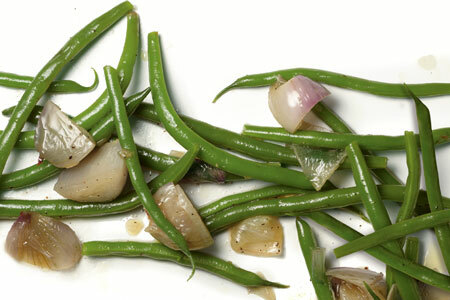 3/ Add green beans to boiling water and cook for 5 minutes. Drain. Toss beans with shallot mixture. Serve immediately. 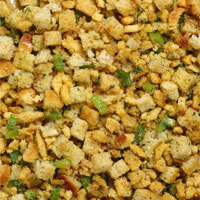 Make your stuffing with wholegrain pilaf instead of bread and you'll trim 61 calories and seven grams of fat. Not only will these slow-to-digest grains help keep you full, but they've also been shown to blast ab fat. 1/ Combine chicken broth, 1 3/4 cups water, and 3/4 teaspoon salt in saucepan. Bring to a boil. Add rice. Reduce the heat to low, cover, and cook for 40 minutes. 2/ Ten minutes before rice is finished, heat olive oil in a saute pan over medium-low heat. Add onion and saute until just soft, about 5 minutes. Add apricots, lemon zest, 2 tablespoons water, and 1/4 teaspoon ground black pepper. Stir well and remove from heat. 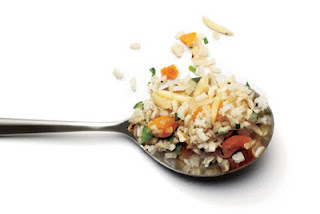 3/ Once rice is cooked, remove from heat. Let stand covered 5 minutes. Uncover and toss with onion mixture, parsley, and almonds. Serve. Not only is this dish practically fat-free, but the chili powder contains capsaicin, which studies have shown may inhibit fat-cell growth and help people consume fewer calories. And cinnamon is no slacker spice either: It keeps your blood sugar stable and your appetite in check, so you won't be tempted to go back for a second helping. 1/ Bake the sweet potatoes in a 425°F oven until they are soft, about 70 minutes. Remove sweet potatoes from oven and allow them to cool slightly. 2/ In a small bowl, whisk together orange juice, orange zest, brown sugar, 1/4 teaspoon salt, cinnamon, and chili powder. 3/ Scoop out the insides of sweet potatoes and place in a large mixing bowl. 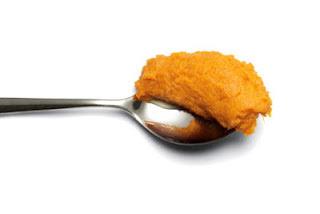 Pour orange juice mixture over sweet potatoes, mash well, and serve. Do you love traditional turkey stuffing enough to take the colossal calorie splurge most stuffing recipes require once a year? With a little revision we’ve made this once-a-year favorite a low-calorie food that you can eat year-round. 1. Preheat the oven to 350°F. Coat a 12" x 8" baking dish with no-stick spray. 2. Coat a large baking sheet with no-stick spray. Place the bread on the baking sheet and mist with no-stick spray. Bake for 15 minutes, or until golden brown. Transfer to a large bowl. 3. Coat a 10" no-stick skillet with no-stick spray and place over medium-high heat until hot. Add the oil, celery, onions, poultry seasoning, thyme, and pepper. Cook, stirring, for 5 minutes, or until the onions are soft but not browned. 4. Add the stock to the bread cubes in the bowl. Toss to mix. Add the onion mixture and mix well. Transfer to the prepared baking dish. Bake for 30 minutes, or until golden brown. NOTE: To freeze, cool the cooked casserole. Wrap the baking dish in freezer-quality plastic wrap, then in freezer-quality foil. To use, thaw overnight in the refrigerator. Remove the foil and plastic wrap; discard the plastic wrap. Cover with the foil and bake at 350°F for 15 to 20 minutes, or until hot.